The Broadway Park Lofts are a victorious triumph in architectural achievement and urban residential development perseverance. These luxurious loft-style condominium units are refining urban lifestyle preferences and changing the landscape in Salt Lake City. After a rocky start with the first phase of the project, construction halted when the housing market took a dive in 2009 and the promising development was left sitting as an empty shell. After a three year stalemate and a maze of legalities, the developers at ClearWater Homes acquired the project through grit, determination and vision which have culminated into a one-of-a-kind modern urban living experience which is truly the first of its kind in Salt Lake City. Located at 360 W Broadway (300 South) in downtown Salt Lake City, the two towers of the Broadway Park Lofts, named ‘Parkview’ and ‘Lanai’, hold a total of 82 units housed over 3 levels. Each unit spans 2 floors and range in size from 424 sq. ft. to 1,100 + sq. ft. (excluding Penthouse units) and they are available in one or two bedroom floor plans. The main level has received R2 zoning to allow for market units; perfect for coffee shops, yoga studios, art galleries and other community enhancing enterprises. The second and third levels perfect a sleek, industrial design with lanai style balconies and modern, garage-door-style floor to ceiling windows that open up the urban lifestyle to an outdoor living experience. But it is the 3rd level that really benefits from one of the most luxurious features in urban living…a private roof-top deck. According to the American Institute of Architects, 63% of architects cite outdoor living space as the most popular ‘special function room’ in housing construction, and Remodeling Magazine’s 2014 Cost-Vs.-Value Report includes multiple deck addition options in the ‘biggest gainers’ category. There is no doubt that outdoor living space is growing in demand in residential construction in both single family homes and multi-residential developments. 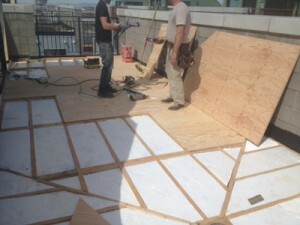 Roof decks sometimes bring hesitancy to developers as there are so many considerations to constructing them properly. When any outdoor pedestrian surface is situated over living space, a reliable walkable, waterproof surface is critical. ClearWater Homes boldly and confidently set precedence for roof top decks in Salt Lake City with this project by utilizing the specialized roof deck waterproofing provided by Duradek vinyl membranes. Not only was Duradek a proven, reliable, warrantiedsolution for waterproofing the roof decks, but it also provided a low maintenance surface for the owners of the units since Duradek vinyl does not require any maintenance to continue performing…just an occasional cleaning to maintain its aesthetic appeal. Broadway Park Lofts garner some inspiration from its namesake and brings New York style luxury to Utah where roof decks are gifted with the amazing views found in the Salt Lake City skyline and amazing Utah sky. This developer has recognized that roof decks do not need to be restricted to harbour cities where they are traditionally found in greater numbers, and they can take advantage of the views and maximize space in any community. The roof decks at the Broadway Park Lofts bring the ultimate urban advantage giving these Salt Lake City residents the ability to enjoy the sights of the Saturday Farmer’s Market, the 4th of July fireworks or the Twilight Concert Series right from the comfort of their own home. After all, lifestyle is really what this development is all about. With a Walk Score of 89 out of 100, residents can walk or bike to work, enjoy the local parks and enjoy gastronomic favorites right on the same block like Tony Caputo’s Market, Carlucci’s Bakery, Bruges Waffles and Frites; even Gateway Mall is mere walking distance away. Plus, when traveling, residents can enjoy leaving their car in the secure garage and walk to TRAX to hop the train to the airport and never have to rely on paying for parking. If you are in the market for a condo purchase in Salt Lake City and want to snap up one of the penthouse units with a roof top deck you may be disappointed because those rooftop units currently support a long waiting list of potential buyers waiting to hear of the next release date for availability. 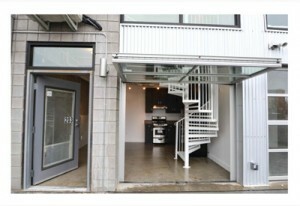 However there are still some of the first and second level units available for affordable urban luxury. Currently there are 12 new residents (with a dozen more in the purchase process)already enjoying their new lofts and surrounding Warehouse District neighbours and local businesses. ClearWater Homes of Utah has a mandate of building functional, beautiful and energy-efficient homes and this urban masterpiece in the heart of Salt Lake City is an incredible example of functionality meeting luxury. Now, with the cautiously optimistic resurgence in new build construction, ClearWater Homes has made The Broadway Park Lofts a shining example of the best in urban living by maximizing space in a desirable urban center and by meeting the growing demand for extending residential living space to the outdoors. Join Duradek of Utah’s (Dekmax) Matt McClure to get a sneak peak at these gorgeous rooftop decks and take advantage of making your inquiries on the unique features of roof deck waterproofing. 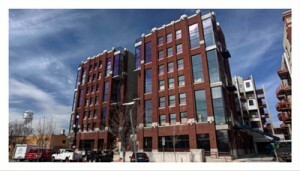 Design professionals can get a detailed look inside the Broadway Park Lofts when the Salt Lake City chapter of the Construction Specification Institute (CSI-SLC) will conduct a tour on May 21st, 2014. The tour will cover the layout of the buildings and discuss the obstacles, successes and future of the final development which is expected to be completed mid to late summer 2014.